Decoding gardening advice is a never-ending challenge. Some gardening advice you receive is good – some, debatable, and too often, just plain wrong. Unfortunately, even the bad advice is frequently repeated by new and experienced gardeners alike. My guest this week, Dr. Jeff Gillman – Director of the UNC Charlotte Botanical Gardens, wrote a book called Decoding Gardening Advice: The Science Behind the 100 Most Common Recommendations. As the title implies, this book breaks down which advice is scientifically sound, and which isn’t. If you’ve been listening to my podcast, you know that I’ve covered some common garden myths in previous episodes. This is a favorite topic for many listeners, and frankly – there is so much bad advice still being passed along out there – I love these opportunities to set the record straight. 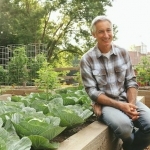 Dr. Jeff Gillman enjoys researching the science behind common garden advice, and he’s written to share the lessons learned. Fortunately, plants are tougher than you think. They can weather most bad gardening practices, but they won’t reach their full potential. There is one bad and common practice which does, ultimately, start the clock to ultimate death. I hope by the end of this episode you’ll spread a little advice of your own – to learn the facts before taking action. So, let’s dive in and explore the advice Jeff’s book deems is either Debatable or just dead Wrong. It’s easy to understand why many gardeners would think adding sand to clay soil makes sense. Clay is very dense and heavy. It doesn’t drain well. On the other hand, sand is light and drains quickly. So, why wouldn’t a combination of the two types create the ideal blend? The truth is the clay particles fill the space between the sand particles, so you end up with soil composition similar to concrete. It will be more dense and compact than the clay soil you began with. Solution: Improve drainage in clay soil by adding organic materials – like compost. The organic matter provides some immediate drainage benefit, but the benefit increases over time. Microorganisms in the soil go to work on the compost and the clay, resulting in a richer, loamier soil. The more organic materials you can add, the faster you will see improvement. 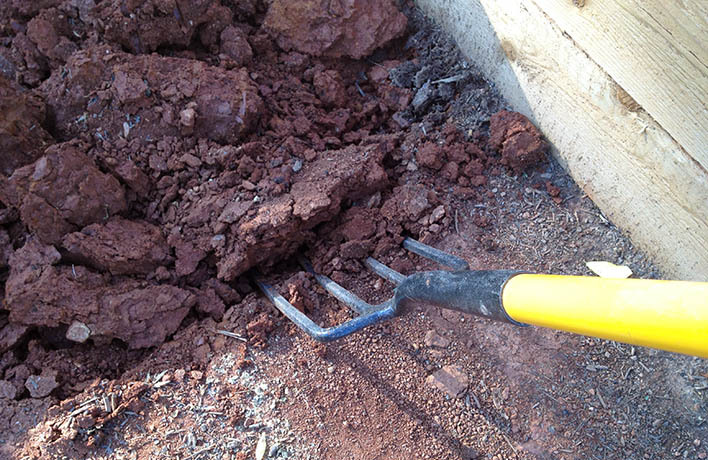 Clay soil is heavy and can be difficult to work with. 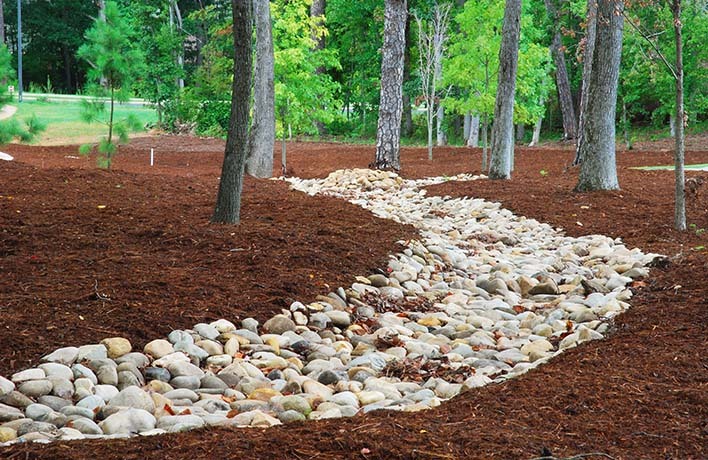 Adding organic materials is the best course of action to approve drainage and texture. When plants wilt, they are under stress. Stressed plants are more susceptible to attack from pests and disease, so allowing plants to become stressed is never a good idea. Plants grow through the expansion of their cells – through water. When they wilt, they don’t have enough internal water pressure to grow – so their growth process slows down and can even stop altogether. Water-deprived plants can sometimes go into an unseasonal dormancy as a defense mechanism. Solution: Pay attention to how long it takes your plants to wilt, then water just before they reach that stage. For example – if you notice your butterfly bush looking droopy five days after its last watering, plan to water it every four days. Just remember that watering needs for all plants will change as temperatures and humidity rise and fall throughout the year. So, stay vigilant. Jeff and I have both performed demonstrations to prove adding material to the bottom of containers will actually hinder drainage, but still, there are doubters. Once again, it’s easy to think gravel would be a good idea, but the science proves otherwise. Water doesn’t move readily between areas with differently sized pores. You can watch a demonstration on my joegardenerTV YouTube channel. 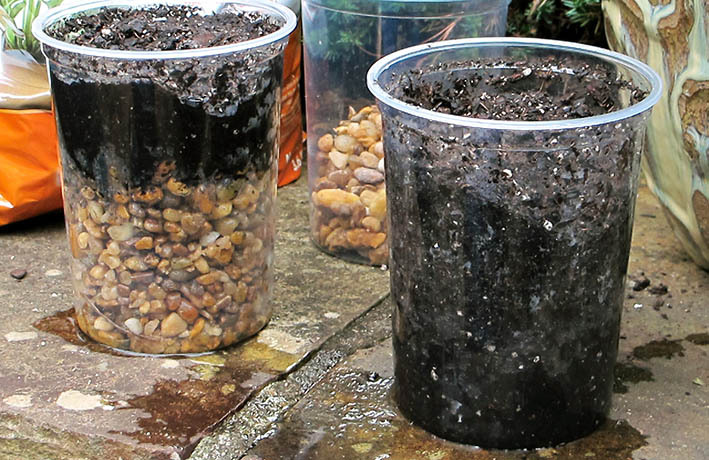 Fill one clear, plastic cup with potting soil. In a second clear, plastic cup; pour gravel in the bottom half and potting soil on top to fill the cup. Pour water in both cups and watch while the water in the all-soil cup will move to the bottom. The water in the cup with gravel will move to the area where the soil meets the gravel, and it will sit there. The same thing happens in a container of any size. Water will move down to the spot where the soil meets a different surface. This means, your container plant roots may be sitting in saturated soil. Will they survive? Probably, but they won’t thrive. Solution: If you want to add filler to lighten the weight of a large container – or to reduce the amount of soil you need – try adding perlite to the potting soil. You can mix it with the soil, and it will lighten the overall weight and improve overall drainage. You can do the same with vermiculite, however vermiculite will compress over time, which will reduce drainage. If you add foam packing peanuts or a layer of perlite to the bottom of the container, just remember that water will pool at the area where that layer of filler meets your potting soil. Watch my demonstration and, then, try it for yourself. Water will drain through a cup filled with all soil, but that water will remain where gravel and soil meet. It is true that landscape fabric can create a barrier to prevent weeds from sprouting. However, that fabric also keeps water from getting to the soil surface. It stops the growth of any vegetation underneath it, and it can increase the soil temperature. So if you’re watering plants surrounded by landscape fabric, much of that water is just running off to the edge of the fabric – instead of reaching the soil at the base of your plants. Over time, the pores of the fabric get clogged, repelling even more of that water. Plus, an increased soil temperature from the fabric can be detrimental to plant health during times of extreme heat. Solution: A two-inch layer of natural mulch is much more effective at blocking light, while allowing water to reach your plants. As a bonus, it breaks down slowly over time, which improves the overall health of your soil. Try it for yourself. Cover one bed with mulch and leave the other bed mulch free. You will quickly discover which bed has a weed problem. Mulch is your best weed barrier – bar none. Perhaps you have an area where you don’t want anything to grow at all – like a spot you plan to cover with landscape rocks? For those situations, landscape fabric may be the proper solution. Before you use landscape fabric, think ahead. After 5-10 years, wind will have blown dirt into the landscape rock, and weed seeds will inevitably spring up in that dirt – above the landscape fabric. Oftentimes, those weeds will root down through the fabric into the soil surface – which makes pulling those weeds challenging, to say the least. Removing the fabric itself becomes more challenging as years pass too. As long as you understand the implications, you are in a better position to make the right choice for your garden. This just doesn’t happen. If this has occurred in someone’s landscape, he or she has been victim to the rare exception. Termites and carpenter ants just don’t seem to be attracted to wood mulch. On the other hand, it is important to keep your mulch layer pulled back from the base of trees or from the wood siding on your home. It’s best to leave a 4-6” gap to discourage any pests from traveling between those areas. Where mulch meets the solid surface of the house or tree trunk, it is also more inclined to hold moisture fostering diseases or fungi. So, allow a little breathing room. Solution: Keep using properly placed mulch and rest easy while enjoying the many benefits mulch provides. Wood mulch will provide many benefits in your garden and landscape, and it won’t attract termites or carpenter ants. It’s commonly thought that fertilizing in fall will encourage the plant to put out new growth which will be damaged during the cold temperatures of winter. Logically, that makes sense, but the science doesn’t bear it out. Solution: The evidence has shown that it makes sense to fertilize in the fall. Plants are taking up nutrition all throughout the year – including fall and (in many parts of the U.S.) winter. Science has proven that the nutrients a plant takes up in fall is held through the winter and is used to send out the first flush of growth in spring. So by fertilizing in fall, you are setting that plant up for a healthier spring. It’s true that mycorrhizae provide benefit to your plants. These fungi work synergistically with plant roots to collect and provide them with water and nutrients. In return, the plant provides the mycorrhizae with carbohydrates as a food source. This exchange does allow your plants to take up more nutrients. However, mycorrhizae are extremely sensitive to environmental changes, so mycorrhizae sold commercially or promoted on soil packaging are usually dead. As they were transported, they were subjected to varying temperatures, and they just can’t sustain in those shifts. Let’s say for argument’s sake, the mycorrhizae you purchase did manage to survive the journey. Will they boost your plants? Maybe not. There are many types of mycorrhizae, and they all perform slightly different work with different plant types. So, the mycorrhizae you import may not be the type your plants will benefit most from – and in some cases can do harm. Odds are better that the mycorrhizae, which are nearly always present natively, will provide all your plants need. Solution: If you find a great deal on premixed soil which includes mycorrhizae, buy it. The fungi are likely dead, but you got a good deal on soil – count that a win. Just don’t spend your hard-earned money specifically to buy soil featuring mycorrhizae. It’s not worth it. Up – Nitrogen: It stimulates foliage growth above ground. Down – Phosphorus: It stimulates root growth under ground. All Around – Potassium: It helps plants grow strong cells for better all-around health. The thing is, plants require much less phosphorus than is historically recommended. Many plants require more of one of the secondary nutrients – like carbon – than they need of phosphorus. Fertilizers marketed as “bloom fertilizer” and which are high in phosphorus are often not necessary and provide much more of that nutrient than your plants require. 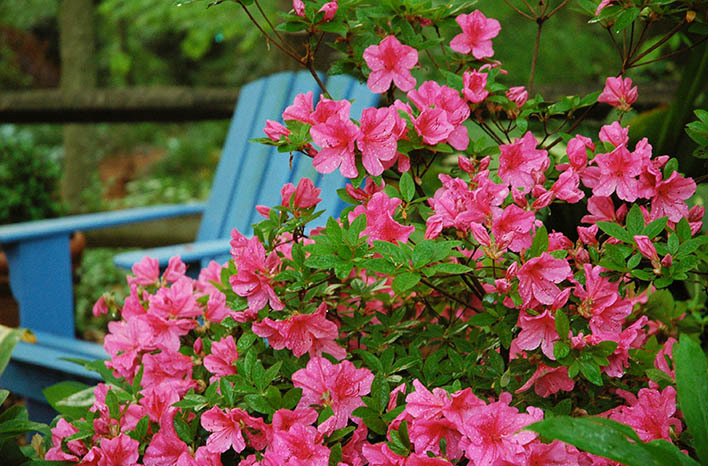 Many gardeners add phosphorus to increase the bloom power of their shrubs. It’s usually unnecessary, and it is depleting a valuable unsustainable resource. Jeff and I always recommend getting a soil test before you ever add nutrients. Soil tests are easy and inexpensive, and they will tell you if your soil requires phosphorus at all. Why does it matter? Well aside from the risk of burning your plants with an overdose of phosphorus, that excess nutrient is susceptible to leaching out of the soil in your garden and into waterways. Excess nutrients in our lakes and streams can cause eutrophication, algae bloom, which affects the health of the ecosystem as a whole. As importantly, phosphorus is a limited resource. It is mined in just a few locations in the world. As it’s mined, this resource disappears. We are slowly running out of phosphorus, so it is important we begin to work to conserve it. Solution: Get a soil test before you opt to fertilize. If you opt to buy a “balanced” fertilizer, avoid the common 10-10-10 ratio. Instead, Jeff recommends a 6-1-4 ratio as a better, low-phosphorus option. 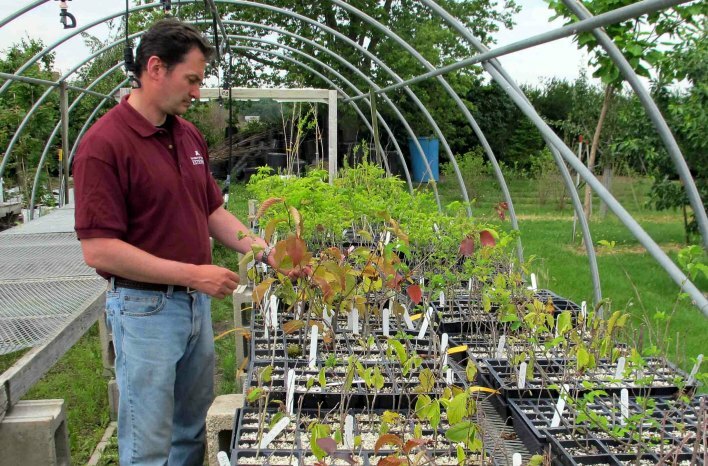 Although fertilizing at the time of planting, is nearly always recommended, and may be beneficial in a few situations – plants typically don’t take up nutrients for their first year after planting. By adding fertilizer to those new trees and shrubs, you risk fertilizer burn – which can stunt their growth rather than promote it. Solution: Here again, be sure to get a soil test before you add fertilizer. Test results may show you have soil low on phosphorus or some other nutrient. If so, adding a little of that nutrient can bring the balance your plants require for optimal health, but when you don’t know for sure – don’t add anything. I have always used inexpensive, 40-watt shop lights. The fluorescent bulbs have always worked well for me, but this past January I decided to experiment. I purchased some expensive full spectrum LED grow lights, and to be honest, I struggled. I was accustomed to placing the fluorescent bulbs just above seedlings, but the full spectrum LED lights were much too strong for that. I adjusted their height over and over to find the spot which provided sufficient light without stressing my seedlings. Ultimately, those full spectrum LED bulbs needed to be about 50” above my seedling trays. Was I wowed by the results? Not really. Jeff also participated in some experimenting – using high and low-end LED lights as well as full spectrum lights and traditional 40-watt fluorescents. Seedlings under the full spectrum lights didn’t do much better than those under the fluorescent bulbs. 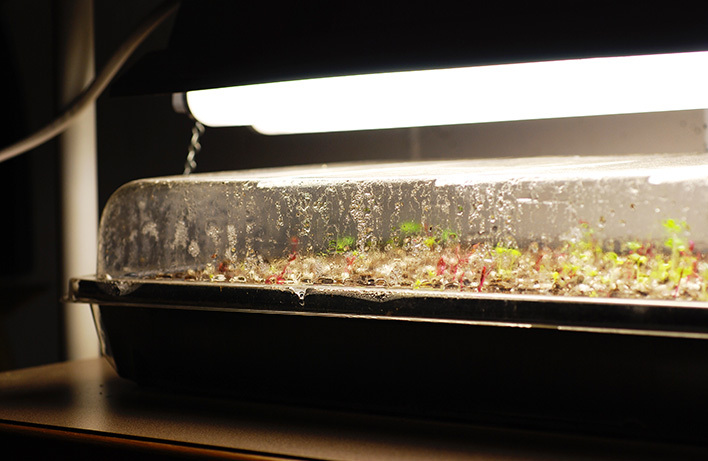 Meanwhile, seedlings under the low-end LEDs struggled significantly. The high-end LED seedlings were noticeably healthier, but those high-end systems are very expensive. In fact, the system used for Jeff’s experiments cost about $6,000. That’s a bit of a financial stretch for most of us – and the truth is, they just aren’t worth the expense. Solution: Keep using those 40-watt fluorescent shop lights. You might choose to buy different systems and perform some experiments on your own, but don’t feel like those hyped-up LED and full-spectrum lights are necessary for success. You don’t need to spend a fortune to provide the light your seedlings require. The fact is, those expensive systems don’t always perform much better than an inexpensive 40-watt shop light. I’ll be honest – I struggle with this one. I never use synthetic treatments on my property. Actually, I rarely use organic products either. I opt for the safest choice of all – manual control. I pick off those pests or spray them with water or allow the time necessary to draw in the beneficial insects which will take care of the problem for me. Jeff argues that there is simply no way to tell whether or not a synthetic pesticide is more or less dangerous than an organic pesticide. He points out that, just because an ingredient is natural – that doesn’t, inherently, mean it’s safe. Consider rattlesnake venom – natural but also lethal. Solution: Opt for manual controls, educate yourself on the predatory beneficial insects at work in your garden, and – if you do resort to treatment – use all of them with caution. Insecticidal soap is a fairly benign treatment. Another known-safe organic product is Bt (Bacillus thuringiensis). It is very specific to caterpillars, so it won’t harm other creatures like flying insects. It can, however, kill caterpillars you don’t want to lose. If the monarch caterpillars feeding on your milkweed come in contact with Bt, it will kill them too. So, take precautions. This is my personal number one pet peeve. This far-too-common and destructive practice gets me all lathered up in frustration. What is tree topping? You’ve probably seen it at least once. 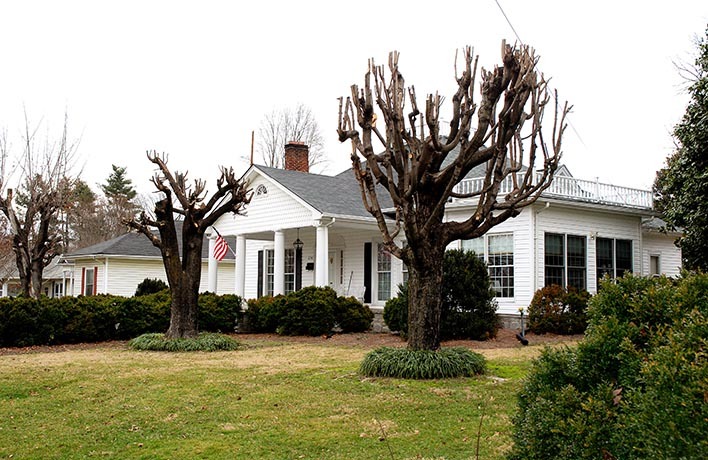 The top limbs of a tree are sheared off, creating a flat-top appearance. If you spend even five minutes learning the most basic aspects of tree growth, you will quickly learn that this method is patently wrong. In fact, it creates many of the situations that those who top their trees are trying to avoid. These trees have been topped – sheared off to reduce their overall height – and, as a result, they will be dead long before their time. Once a tree is topped, it quickly sends off new branches – called water sprouts – to replace the lost foliage and generate energy. Those water sprouts grow off too thickly and at odd angles. The dense growth and narrow crotch angles (where the branch meets the trunk) create pockets for disease to fester. Water sprouts are also not as strongly joined to a tree trunk as are tree branches, so larger and mature water sprouts are more susceptible to breaking off and causing damage. When you top your tree, you are killing that tree. It won’t happen next year or the year after that, but you have started the clock. 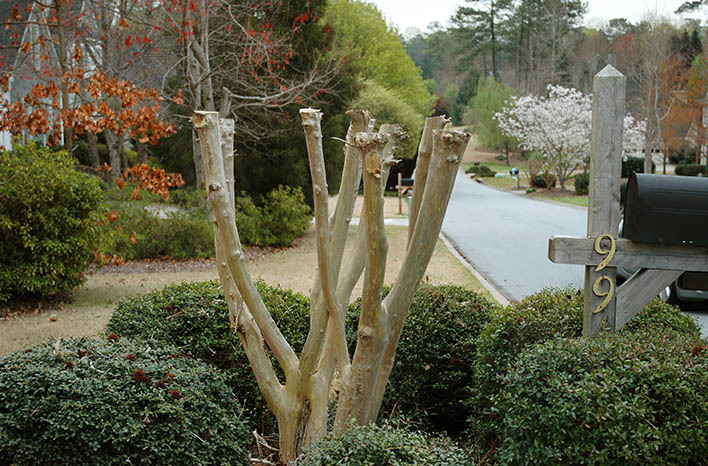 Topped trees always die much more quickly than trees which are properly pruned. I’ve literally watched way too many old-growth trees die specifically because of tree topping. Solution: Never top trees. Prune appropriately, or hire a certified arborist to do the work properly. I hope this information guides you as you make choices in your garden. If you haven’t already listened to my conversation with Jeff, I recommend you scroll to the top of the page and press the Play icon in the green bar under the page title. One final piece of advice: Share all the science-based advice here with the gardeners you know and love.